Many of these fond recollections are true. 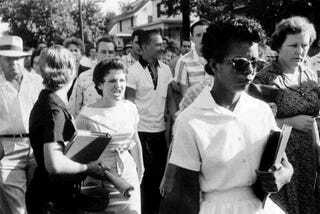 Black teachers came from the communities where black schoolchildren lived, and so were able to maintain standards of discipline and accountability that proved difficult after integration and busing. And because white state universities wouldn’t hire black teachers before Brown, many black secondary schoolchildren were taught by black teachers who held Ph.Ds. But many of us seem to forget, that all of this came at a cost. Yes, those blacks who were educated often obtained a superior education in the years before Brown, especially in our cities. But, recall, most black students in the South did not attend school beyond the 7th grade. In Maryland, for example, there were no black high schools in most counties of the state in the 1930s. Blacks who lived in Baltimore County—the now suburban (then rural) area surrounding the city of Baltimore—and wanted to attend high school had to take an exam to be admitted to one of two black schools in Baltimore. Students from the County who were admitted to Frederick Douglass High School in Baltimore had to pay tuition and figure out for themselves how they would get to and from school in the city. The result was that only those blacks who had relatives in Baltimore with whom their children could board, or those who could afford daily transportation costs, could attend high school. Two decades before Brown, a young Thurgood Marshall (himself a Baltimore city native and Frederick Douglass alum) sued Baltimore County for its failure to provide a high school education for blacks. He didn’t win that case, but soon after the dismissal of the action, the Baltimore County School board decided to begin constructing a high school for black students. Of course, the contemporary state of public education in many of our cities is abysmal. If you saw the 2008 HBO documentary about failing student performance at Frederick Douglass High School, "Hard Times at Douglass High: A No Child Left Behind Report", it’s hard to believe that this was the once competitive highly-regarded secondary school where in 1930, black students performed the play "Sleeping Beauty"—entirely in French. The reasons for contemporary public education failures are multiple. It begins of course with the refusal of whites to accept the Supreme Court’s decision in Brown. Who could have imagined that so many whites would be willing to oversee the destruction of the public education system rather than have their children attend school with blacks? White flight from public schools, and the opening of private all-white academies transformed and destroyed public education in the South. The closing of the Prince Edward County, Virginia school system represented the most shameful opposition to Brown. There, officials closed the public schools in that county *for five years* rather than integrate, damning a generation of black students to delayed education, or in most cases no education. (Several years ago the Virginia legislature offered scholarships as a form of reparation to black former Prince Edward County school children who had their education interrupted). Today, broken families and communities, an often uncertified and unprepared teaching force and the persistent lack of funding has imperiled quality education in many of our cities. Testing our way into quality education, as required by the No Child Left Behind Act, hasn’t worked. But things may be changing. In Baltimore, a new school superintendent, Andres Alonso, has emphasized decentralization of school hierarchies, giving principals more control of how they use funds allocated to their schools. This, along with tough, rigorous performance standards, and the infusion of a cadre of dynamic teachers and innovative after-school programs are turning things around. The activism of students themselves in community groups like The Algebra Project, which has engaged in vigorous, vocal and creative civil disobedience (like creating their own student-run school board and challenging the legitimacy of the City School Board) is keeping education front and center in public debate. Brown began with great promise – one that has yet to be fulfilled. But let’s not blame Brown for the failure of our schools. Instead, Brown should serve as our inspiration to demand that our states do what the Supreme Court demanded they do 55 years ago: provide quality education to our students regardless of race. Even more that the electing a black president, the commitment to educate black children would represent a truly historic, transformative and long overdue moment in our country’s history. MORE: Read Ifill on the Ricci v. DeStefano Affirmative Action case.